CARL R. EVERED was born in New Jersey in 1893 to Joseph G, and Anna Evered. His father was a showcase maker. He grew up in Camden's Eighth Ward at 1711 Broadway. 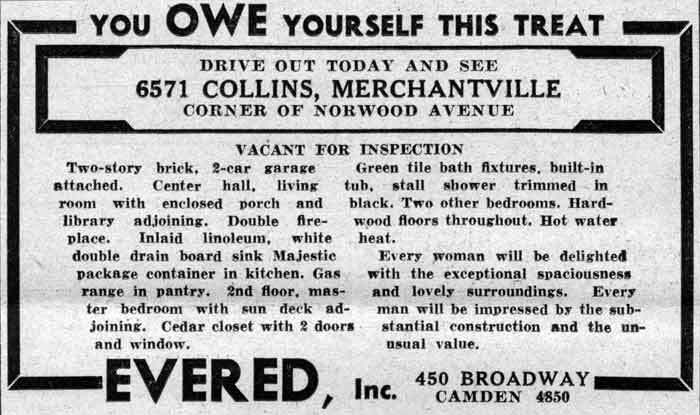 After serving in World War I, Carl Evered returned to Camden and established a real estate business. At the time of the 1920 Census he was living at 1711 Broadway with his widowed mother Annie and younger brother Fred. He married shortly after the census was taken. Wife Helen bore him a daughter, Doris, around 1921. 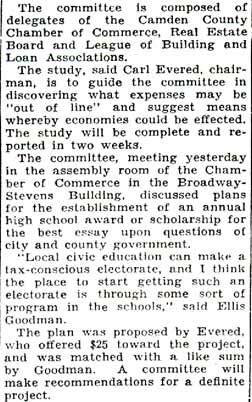 Carl R. Evered ran for election to the City Commission in May of 1927. Although endorsed, along with commissioner, Melbourne F. Middleton Jr. and Carroll P. Sherwood, by Camden's Non-Partisan League, his slate, which included newly appointed Judge Frank F. Neutze, and Dr. Saunders, did not win. 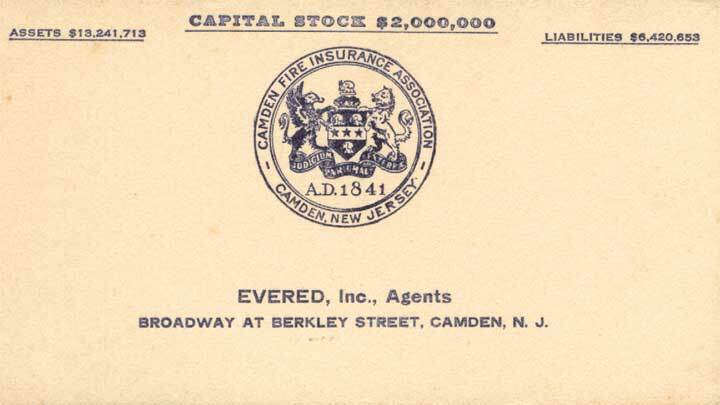 Carl Evered did well in the real estate business, and by 1930 owned a building at 450 Broadway, the corner of Broadway and Berkley Street, where he lived and conducted his real estate agency. 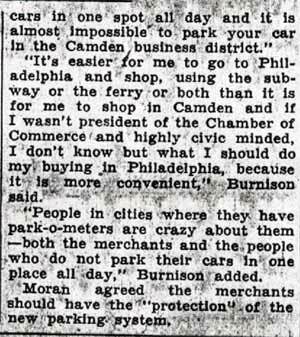 With James W. Burnison, he was an early proponent of bringing parking meters to Camden's shopping areas to aid local business owners in the 1930s, and also was a member of the committee and chairman of the housing projects committee of the County Real Estate Board. 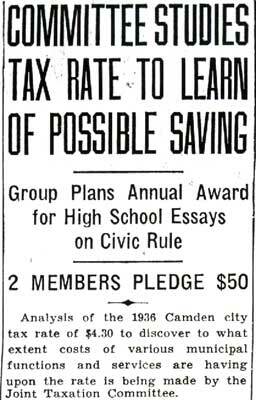 Carl Evered also served as the president of the Camden County Board of Taxation in the late 1940s. He had also added insurance to his real estate business by that time. Carl Evered's real estate business, known as Evered Inc., remained at 450 Broadway into the early 1970s, and Carl Evered resided there into the 1960s. By 1970 he had moved to the Stuyvesant Terrace apartments in Cherry Hill. Carl Evered later moved to Penns Grove NJ. 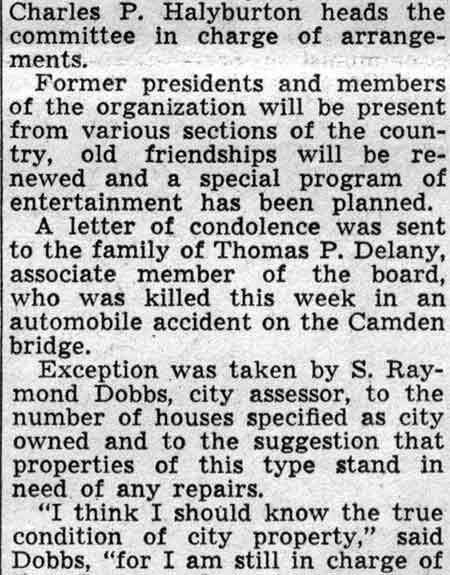 He passed away in January of 1975, survived by his wife, who died in March of 1985..
Francis B. Wallen, Sr., chairman of the executive committee of the Camden County Chamber of Commerce yesterday. As head of that committee, Wallen will direct the activities of the Chamber during the remainder of the year. it was announced. 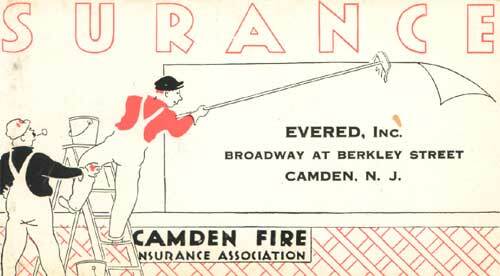 Other members of the executive committee who will act with Wallen are B. H. Hudson, superintendent of the Atlantic Division of the West Jersey & Seashore Railroad and Elwood F. Thompson, secretary of the Camden Fire Insurance Association. The executive committee which was named by the board of directors, will replace Leonard R. Baker, who was acting president of the Chamber since January 1. Four vice-presidents also were named by the board of directors. Only two of those selected have been assigned. They are James V. Moran in charge of transportation and Carl R. Evered in charge of finances. The others are W. H. Chew and Thompson. Wallen, the executive committee chairman, is the only president of the Chamber to ever serve three terms. 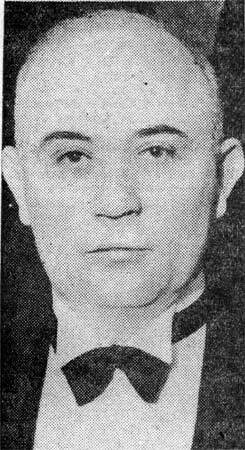 He was in office in 1928, 1929 and 1930. Since then he has been a member of the board of directors. An East Camden man was given one day to vacate the house he now occupies or go to jail. The moving order was issued yesterday by Police Judge Pancoast to William J. Cassidy; 918 North Twenty-fifth Street, when he was arraigned upon complaint of Harold Hartman, representative of Carl Evered Company, 450 Broadway, real estate firm. Hartman said, Cassidy moved his furniture back into the house. Cassidy said he returned to the house when the court officials said it would be all right to do so. Trenton, June 8.-Taxpayers and members of civic bodies throughout the state are expected to attend one of the largest protest meetings ever held in New Jersey here tomorrow. Thousands of pledges of active support have been received by the New Jersey Taxpayers' Association, indicating according to its officers, a "growing rebellion against high taxes and the inaction and horse-trading deals of the Legislature." Round table discussions will be held throughout the day and will be climaxed by the giant mass meeting at 8 p. m. in the Soldiers' and Sailors' Memorial Building in Stacy Park. "All roads lead to Trenton seems to be the war cry throughout the state as the protest machinery of the association gains momentum," it was stated. "The same public indignation that turned the annual dinner and convention of the association into a spontaneous registration of disgust with the Legislature, is working to bring to Trenton the greatest assemblage for protest purposes that the state has ever witnessed. All types of community civic organizations throughout the state have signified their intention to take part in the fight and will send large delegations here for the meeting." Announcement has been made by the Camden County Chamber of Commerce that it will send an impressive "motorcade" to Trenton with police escorts all the way. Numerous delegations liberally supplied with banners will leave no doubt as to the determination of these groups from Camden County, it was said. Delegations from numerous towns throughout South Jersey will accompany the Chamber of Commerce delegation, together with a delegation from the Congress of Civic Associations of Camden. Members of civic bodies making up the Congress will leave at 6.30 p. m. from the Hotel Walt Whitman, Camden. Enough cars have been promised to take care of all members. Among the announced speakers is General John Hartnett, of the Atlantic City Citizens and Taxpayers Association, who has promised he will "rake the politicians over the coals." E. W. Wellmuth, executive vice president of the Newark Chamber of Commerce, is another scheduled speaker and leader of civic and business groups of that city. Another large group of protesters is expected from Asbury Park, where recently there has, been a great fight for the city manager plan of government. Other features of the protest meeting will be a large orchestra and community singing directed by Dr. J. L. Edwards, of Riverside, noted leader of community singing. Preparations are being made by the taxpayers' organization to accommodate an enormous crowd in the Soldiers' and Sailors' Memorial Building in Stacy Park, the largest auditorium in the city. Amplifiers will be installed to provide for a large overflow audience. The convention of the taxpayers' organization wlll start with registration at the Stacy Trent Hotel, at 9 o'clock and appointment of committees. Round table discussions will follow at 10 o'clock. The subject of another table discussion for men will be "Model Procedure for County and Local Associations" with Wilder M. Rich, research director, and Francis B. Elwell, field secretary of the New Jersey Taxpayers' Association, in charge. Among those who will speak before this group will be Dr. William Kirk, vice president of the Salem County unit; D. R. Stevens, president of the Ridgewood unit; Irwin Rubenstein, of the West New York and Hudson County units, and H. G. Elwell, president of the Union County unit. Clinton L. Bardo, of Camden, president of the taxpayers' organization, and a candidate for re-election. wlll preside at the afternoon session starting at 2 o'clock. The annual report of the president will be read and A. R. Everson, executive secretary, will report on the activities of the association. There wlll be an election of officers, adoption of a platform, open discussion of matters pertaining to the organization and a report of the resolutions committee. The Camden County Chamber of, Commerce will be represented at the meeting by Loyal D. Odhner, secretary of the chamber; J. V. Moran, Harry A. Kelleher and Carl Evered. J. B. Van Sciver, Jr., of Camden, is a candidate for vice president of the association from the Camden district." The special committee on taxation of the Camden County Chamber of Commerce yesterday endorsed nine of the 11 planks of a platform recently adopted by the New Jersey Taxpayers Association. The committee also went on record as unanimously favoring the resolutions passed by the taxpayers’ association demanding the repeal of the Walsh Act Ripper Bill and the enactment of laws to permit citizens to examine public records at all reasonable times. J.V. Moran, chairman of the special committee on taxation, disclosed that he and his colleagues are directly opposed to the centralization of beer control in New Jersey. A resolution adopted last week, by the New Jersey Licensed Beverage Association favoring local regulation and taxation an beer and delegating to the state the obtaining of revenue from the manufacture and statewide distribution, was in turn passed by the special committee an taxation. The planks of the taxpayers association platform agreed to by the chamber committee includes the pro viding of absolute control of expenditures of public money; provision for budgeting .of all state expenditures; changing of the present policy of State Highway Department management by placing control in charge of a highway engineer; investigation and if necessary revision of the state pension laws; revision of the debt procedure and limiting the debt; provision for adoption of a pay-as-you-go policy; making possible of consolidation of municipalities; investigation of the state educational sys tern to "bring about a reduction of expense to the extent that people will be able to; pay it; and providing for permanent relief from mandatory laws, including tenure of office. The planks which the special committee on taxation apposed were those concerning the regulating and controlling of local finances and permitting the people to choose the form of local government without political interference. B esides Chairman Moran, other members of the special committee on taxation present, were Eugene Haines, of the RCA Victor Company; Roswell A. Robinson, of the .J. B. Van Sciver Company; Carl Evered and Loyal D. Odhner, executive secretary .of the chamber. One of two resolutions adopted yesterday afternoon by the Taxation Committee of the Camden County Real Estate Board opposes the borrowing by Camden county or city of any funds for projects that are not self-liquidating. The resolutions were acted upon at a luncheon of the committee, headed by Leon E. Todd, in the Hotel Walt Whitman. Copies were sent to city and county officials. One proposed loan which the resolution opposed was the application for federal industrial recovery funds to carryon the Camden county park program. It had been called to the attention of the committee that plans are being considered to alter the city and county budgets for various projects. 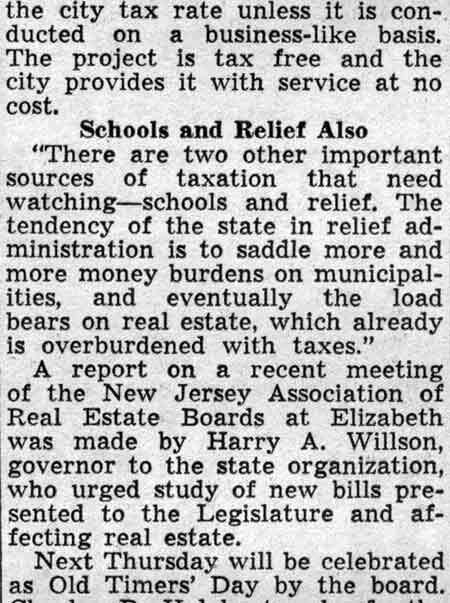 by the joint taxation committee of the New Jersey legislature for the relief of taxation on real estate "provided, however, that all such additional funds so assessed and raised will be utilized on for the direct relief of real estate." Other members of the committee are William S. Abbott, president of the Real Estate Board; Earl R. Lippincott, George B. Robeson, J. William Markeim, Carl R. Evered, William F. Schmid and Edward J. Borden. 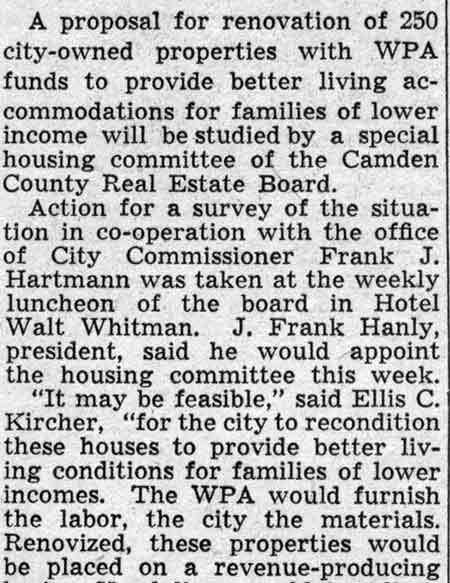 Herbert K. Strattan, a Democratic leader of Haddonfield, also expressed opposition to the park loan appllication. He stressed three reasons as his grounds for opposing the loan, the first being the absence of a definite plan for spending the money. Strattan also charges that the members of the park commission are incapable of handling such a large project and that no one park has been finished and no portion of the parks are self-liquidating, thus necessitating large annual maintenance funds. He also stated the loan would increase Camden's bonded indebtedness, which could not be afforded at this time. Furthermore, "the present difference of opinion on this subject among members of our present city commission would in itself effectively block any real work along this line, " and "We feel that real results along this line require a united front on the part of our commission and the county freeholders." "Our sinking fund, we are informed, is stuffed with our own frozen paper. Such financing, in our estimation, kills the purpose of such funds." 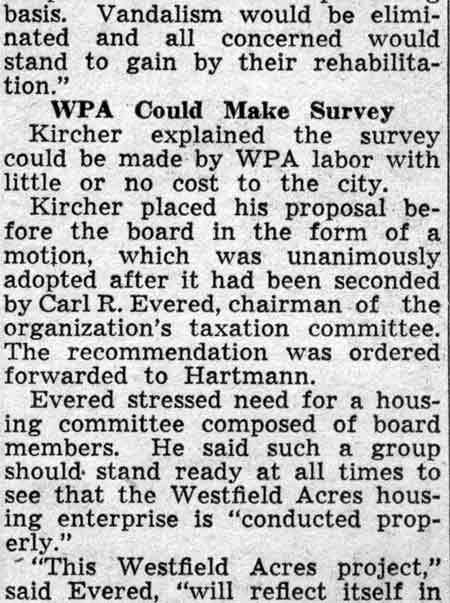 James W. Burnison, chairman of the citizens' advisory committee, reiterated that group's objections to Chapter 60, saying the same guarantees can be provided for bondholders under 77, without putting the city under such rigid state supervision for so long a period. Harry A. Willson, who recently re tired as president of the Camden County Real Estate Board, wants the world to know that he is one of those "who is selling Camden and Uncle Sam long." 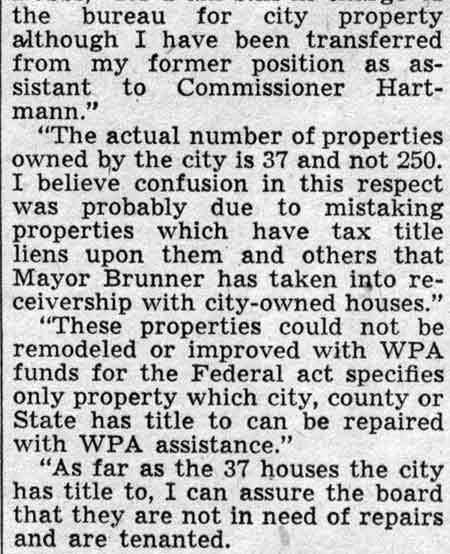 In other words, the Camden realtor says he didn't know the real meaning of "recession" in 1937, that November was his best month, and that by the middle of April, 1938, he expects to see "things humming and business okeh everywhere again." "We had a busy year in 1937," declared Willson, speaking both as an official and a businessman. "And we had a good year in business and I want to say that November was the best month that I had, when everybody was talking about this recession." that there are negotiations that require a lawyer's services, but we realtors feel we are fully capable of making an agreement of sale, drawing a lease and making a settlement. "The majority of the realtors of Camden have a good technical working knowledge of the law. For myself I've been a member of the bar since 1912, and I know scores of other real estate men who are not only learned in the law, but are as capable of handling legal matters in their business as any member of the bar. "We consider that' victory as per haps the largest, feather in our cap for the year. But we're proud that we moved into decent headquarters as well. "We nave headquarters now at 421 Cooper Street, with an executive secretary in charge at all times. It is a headquarters worthy and fitting for, a group of businessmen with the personnel and extensive interests of the real estate board. "We are now able to issue a weekly bulletin, 'The Realtor.' which we send to the real estate men of the county, to various Chambers of Commerce and to other interests vitally concerned about real estate. "I think the real estate board has been of great help in solving municipal problems, too. 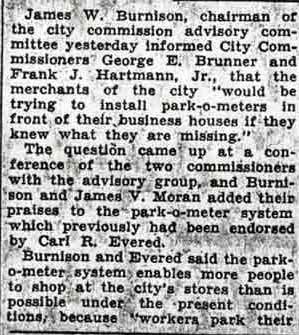 Car1 Evered has been aiding in the matter of direct taxation and Ellis Goodman, on his committee on public parks and beautification has rendered a splendid service to Commissioner Frank J. Hartmann, who has charge of that department. "Their joint efforts have resulted in ridding the boulevards of unsightly signs that were bad advertising for the city. Goodman and his committee also aided in the movement that rid the city of buildings that were unsightly, and standing, gave Camden a bad reputation abroad. "So far as business is concerned I know that my business in 1937 was swell. I feel that the realtors would say the same thing, If each of them was asked regarding their business. November was my best month of the year. "It is a fact that early last Spring houses were occupied to such a great extent that it was impossible to get a house to rent. During the fall this demand slackened off, but I haven't one fault to find with business during 1937, and I think that things will be all right this year. "I look to see this recession come to an end in mid-April. I expect you'll see things popping then. The New York Shipbuilding Corporation should be right in the thick of its work building those two new naval vessels by that time. 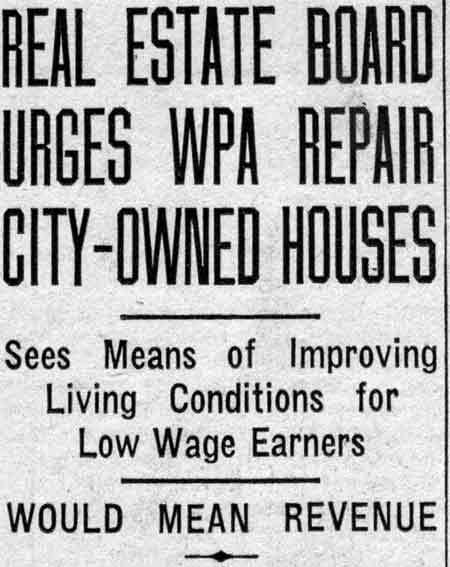 "The working force should be recruited to its full strength by that time, and that means money will be pouring into the city and business is bound t leap upward. "Altogether, speaking as an officer of the real estate board and a business man as well, I haven't fault to find with 1937, and I'm still selling Camden and Uncle Sam long."